that I posted to my blog again! Hi everyone - I'm baaaack! 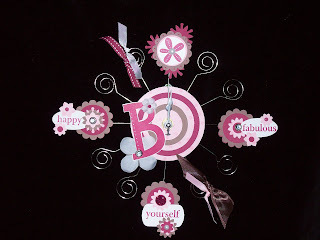 I wanted to share the picture of this clock I created for my upline, Christina Crawford's team website. She selected me, along with 3 amazing stampers from her team to be the current "Featured Artists". We each had to create around 20 projects and the only limit was our imagination. I'd purchased this blank plastic clock from the Target $1 spot last year and hadn't done anything with it and I knew it could be "Fabulous" with the right embellishments! I used the "Just B" stamp set and a color pallette of Chocolate Chip, Close to Cocoa, Purely Pomegranate, Pretty in Pink and Whisper White. As you can see, many punches, ribbon and the Pretties kit were used for this fun project. I had such a great "TIME" creating it - I hope you enjoy this idea!